Zombie Logic From Thomas L. Vaultonburg, Outsider Poet: Is Terrelle Pryor Worth a Look In Fantasy Football? 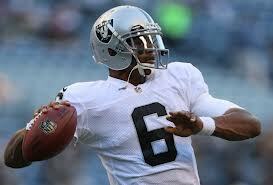 Is Terrelle Pryor Worth a Look In Fantasy Football? With a recent report by CBS football insider Jason La Confora that the Raiders may release quarterback Carson Palmer and his 13.5 million dollar contract, will Terrelle Pryor be the Raiders' quarterback next year. With the recent success of young quarterbacks making an impact early in their first or second seasons, one might be led to believe Pryor has a chance. But here's the deal. Russell Wilson, RG3, Andrew Luck, and Colin Kaepernick all have one thing in common... they can throw the football. Accurately. Terrelle Pryor and Tim Tebow also have one thing in common: neither one can throw a football accurately. And while the Read Option offense might allow the quarterback more freedom in deciding when to run or throw the football, one thing it can't do is make a quarterback hit an open receiver. Pryor will be interesting in fantasy football drafts this season, especially if Carson Palmer is cut by the Raiders, but unless you can get him for an obscenely low draft pick, let someone else have this walking headache. Do you think Alex Smith or Carson Palmer will land with a team like Jacksonville or Arizona and have some fantasy relevance in 2013? I'm not sure either one really has what it takes to play behind a bad offensive line. With the advent of the Read Option era, I think teams might be giving quarterbacks like Dennis Dixon or even Joe Webb a second look.